I#ve just started the game and played my first mission. I am really impressed by your game and I haven’t found anything bad yet, except one little thing. On my first attempt I was almost done with the mission when I lost connection to the server which resulted in me having to play it from the start again. Maybe you can handle this a bit different in the future (especially with long missions)? I will write more stuff here if I find anything. Thanks! Your progress is saved on each wave, so even if you disconnect you should resume in the same wave where you were last time. Did you start again at the very beginning? Yes, I started at wave 1 again. When that disconnect happened, i clicked on check server status and the game closed itself due to this. After reopening the game, I started at wave 1 again. Does the current mission save when i close the game? Yes, your per-wave progress is saved in all cases. What probably happened was that the connection wasn’t working for some time as you were playing, meaning that your progress couldn’t be sent to the server. Later, when the failure was finally reported to the game, all queued up data was lost. It could be a random occurrence, please let us know if it happens again. Fair enough. The UI is intentionally minimalistic, but if enough people complain, it can always be changed. Can’t u make it in a style like in previous episodes at least? I am fine with the UI. It’s different than in the old episodes, but it fits. Im really having fun with this game! You can only have one mission in-progress at the moment. Yeah, it happened to me too, but no problem! I see it but it was very easy and it was second and last for the daily challenge. Also the side’s was changed. Ah, that’s why some people were separated. But that’s why I got that off-road license! OK, this wave is EPIC. Well, I got a Bend it like Beckhen wave and on the last stage it spawned Chickenauts. You can guess how that ended. @InterAction_studios, it seems like my satellite also fires with left click but it’s set to right click. Also, I find extra lives and missiles way too expensive… an extra life and missile should be around 10 to 20 keys in my opinion. HUD stuff like damage and point indicators are also very expensive. That’s the default. You can change the ſatellite auto-fire in the ſettings. 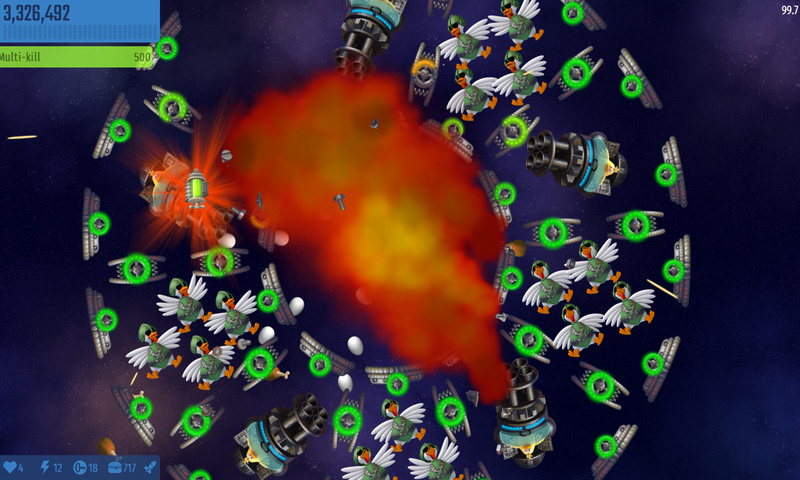 The satellite auto-fire is set to right click, but it triggers with both left and right click. The hard Chicken Invaders is back to the roots! The last CI game was difficult in 2006-2007(ROTY). After so many years IA decided to turn back this difficulty for which I am very thankful to them. The hardest game since ROTY.